Swiss Alps Energy (SAE) plans to deploy mining centers in the Swiss Alps to cut energy costs and create a sustainable mining ecosystem. Bitcoin mining is an energy-intensive process, and the staggering electricity consumption associated with it has become a headache for the cryptocurrency industry. A massive carbon footprint combined with high electricity bills encourage miners to seek more eco-friendly and sustainable solutions. Swiss Alps Energy AG (SAE) intends to utilize thousands of empty buildings scattered over the Swiss Alps to create a mining solution that will solve those two problems at once. SAE has created an innovative modular cube system based on pre-fabricated structures that are flexible, self-contained, and modest in their maintenance requirements. The mining and blockchain infrastructure will be deployed in unused buildings across the Swiss Alps. The Swiss Alps Mining (SAM) cubes will be connected to a central management platform that will monitor their performance and set optimal parameters for each cube to maximize mining profit. The mining cubes will be located at high altitudes, where the boiling point of water is much lower, which makes the mining process far more efficient in terms of power consumption. Moreover, an innovative Organic Rankine Cycle (ORC) system will be used to recover energy from heat wasted during the mining process. Due to favorable outside temperatures, no additional cooling systems would be necessary at the facilities, which will result in drastically reduced energy consumption as compared to similar structures. Switzerland is an attractive destination for mining due to various reasons, including a loyal attitude towards cryptocurrencies and blockchain technology. Apart from that, the country is known for its cheap supply of renewable energy produced by hydropower stations. SAE aims to purchase over 1,400 small hydropower plants to create a decentralized and highly profitable power supply system for its network of mining cubes. The company will allow individuals and companies to purchase or rent both entire SAM cubes and part of their capacity. 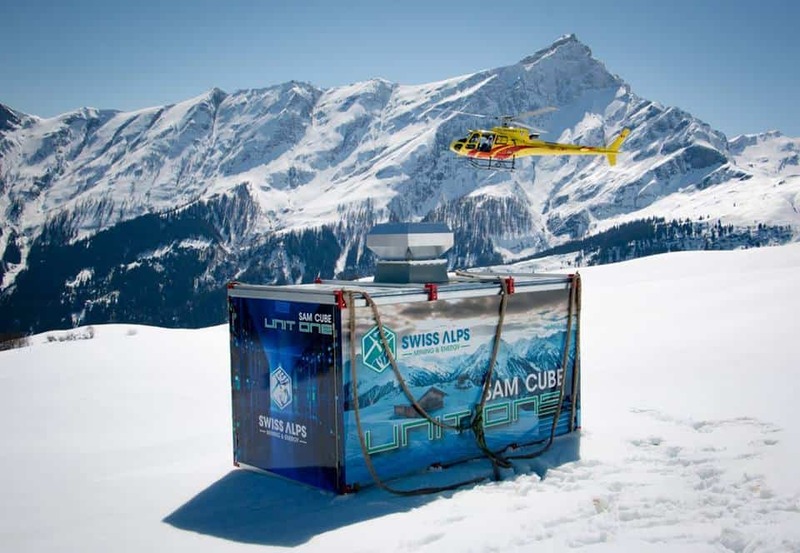 SAM cubes users will be able to deploy and run them in the Swiss Alps or elsewhere. The potential return on investments will amount to 360% in three years of operation, according to SAE estimations. Thus, an investment of $65,000 would yield more than $235,000 within three years. Apart from getting mining equipment, SAE customers will be able to join the SAM Smart Mining network, known as SamaiX. It is an artificial intelligence (AI) system used to determine the most profitable coins and offer recommendations. If a user accepts the suggestion made by SamaiX, the system will adjust their mining portfolio accordingly. SAE strives to support the local economy while preserving Swiss cultural heritage. The country’s remarkable scenery is its main tourist attraction, but many old buildings once used for farming are decaying, turning into a burden for the people who own them. SAE wants to bring these assets back into the economy through new use and digital transformation. The first SAM cube has been in operation since February 2018. Currently, the company is engaged in renting vacant houses and hopes to start leasing cubes in the months ahead. It will make the cubes available for sale at the end of the year. SAE’s private sale started in May, while the public initial coin offering is scheduled to commence in June. The company plans to issue 311 million SAM tokens and reach a hard cap of $96 million across all crowdfunding stages. For more information on this project, head to the official website or subscribe to its updates on Twitter and Telegram.